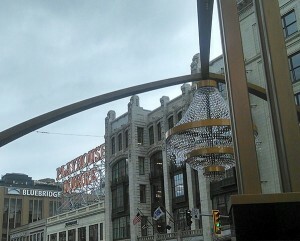 This week, as the lighting ceremony takes place in downtown Cleveland’s Playhouse Square, I am called to think about “transformations.” It is amazing to think back to 2005, when I joined BlueBridge Networks, where Playhouse Square, Downtown, and the Cleveland region was and where it is and going today. It is amazing to consider the growth and excitement happening in the region. It has always been a deeply held personal belief in the way of the human spirit and an abiding trust that the heart is stronger and abundantly more effective than any other power. The human spirit enjoys an amazing resiliency and an incredible capacity to begin again each day, no matter what. Certainly the Cleveland spirit and resiliency is strong, and the region’s reinvention has gained momentum in many ways. The lighting of the outdoor chandelier in Playhouse Square, and other improvements, are a major investment, and it seems to be a spark of something new; however, it is more of a culmination and celebration of years of hard work, investment, and determination by so many. This traction has been led by Art Falco, president and CEO of the Playhouse Square Foundation. It has modeled what a transformation is all about over time. The results today are a byproduct of time and production equaling credibility. Piece by piece the Foundation has been bringing determination to its vision that actually causes them come to fruition. Vision followed by hard work, collaboration, innovation, and execution are lessons for us in our personal and professional lives. Our companies and institutions can model themselves after the vision, work, and focus to its mission by this great Foundation. Our city has great roots and legacy in so many ways. Many of our early captains of industries have left us great, lasting endowments and institutions, which add to our quality of life today — from University Circle, the Cleveland Museum of Art, and several museums all over the region, to Severance Hall and the Cleveland Orchestra, various colleges and universities, parks, and foundations. We have found ways to blend in the old with the new. We have fought back against the court of public opinion by rebuilding and adding and growing new and revised industries, such as Biosciences and Health Services and Information Technology, and even cultivating a burgeoning Film Industry, thanks to many, such as Ivan Schwartz and the Greater Cleveland Film Commission. Great life and business lessons come out of the Playhouse Square success story. Taking stock of core competencies and building off them is a key recipe for success. The district is anchored by its theaters, at the core, and is now augmented by universities, businesses, restaurants, hotels, clubs, and residences. Its core is and remains theatre. Collaborate and invite various partners into your mission to make it viable and sustainable. Be innovative and open to change. Celebrate and restore the old and make room for the new. A great lesson for all in our work and missions is to indeed be accountable to the past and, as it is addressed in parallel, move forward. Playhouse Square was saved from the wrecking ball and then over time it has become one of the greatest theater and technology destinations in the country, as well as a neighborhood and destination. We too can rise up after a fall, and our companies and institutions can take seeming tragedies and turn them into triumphs. Northeast Ohio has a terrific work force capable and willing to reeducate itself. It is made up of immigrants, workers in transition, and returning veterans. BlueBridge Networks is in the IT data center business and it finds itself able to help bridge a gap — to serve as a link in chain, a bond in a connection between students and industry, in education, by serving on the Northeast Ohio Regional Information Technology Engagement (NEO RITE) Board. It is a collaboration of senior IT executives who are committed to advancing the regional IT industry by facilitating robust interaction among employer, education, and community stakeholders. A united industry voice offered the potential to shrink those gaps by enhancing industry feedback to educators, spreading awareness of IT careers, and promoting best practices in experiential learning. That potential was so promising, and initial feedback from the educational community so positive, that these individuals decided to formalize their commitment to move the above initiatives forward. It is important in business to recognize that over time we build equity in our various relationships. We will build and carry on as a result of this equity. What we do in the whole body of our work matters. Mistakes are part of the plan and process, and what we do as a result of them is critical and will be guiding lights for the future. Haters will see you walk on water and say its because you can’t swim. Throw us to the wolves and we Clevelanders will come back leading the pack. Let our haters be our elevators and resolve that no matter what we will work as a team and persevere and be made better and stronger. Continuous improvement is our lot – it is our collective DNA in the CLE … we begin again each day anew, each year and every era, no matter what. This entry was posted in Building Community, Visionaries and tagged Cleveland, entrepreneurism. Bookmark the permalink.